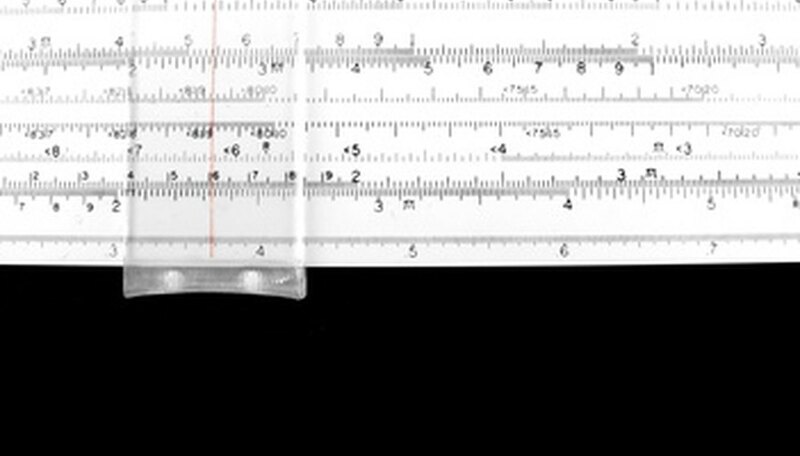 The slide rule is an amazingly versatile tool that helps the user to calculate a number of different mathematical problems. While it is effective, the slide rule isn't used much anymore because of the widespread use of calculators. But if you're able to locate one it can still help you with math problems today. Line up a number on the C scale-2 for example-with the number it's being multiplied by on the D scale-say 4. Shift the slide to the right to do this. Leave the slide rule where it is and find 4 on the C scale. Look once more at the D scale. You'll see that 4 on the C scale corresponds with 8 on the D scale. The number on the D scale-8 in this case-is the answer to your multiplication question (2 times 4). Reverse these Steps 1 through 3 for division. Line up the divisor (8) on the C scale with the dividend (4) on the D scale. Again leave the slide rule where it is and find 4 on the C scale. The corresponding number on the D scale gives you the answer: 8 divided by 4 equals 2. Use the lower scale for bigger problems. When no numbers correspond on the slide rule, shift it to the left instead of to the right. Here you'll be multiplying by tenths rather than whole numbers so remember to move the decimal points to get the correct answer. Use the smaller graduated lines for tenths of a number. Bigger slide rules had more lines enabling them to get surprisingly accurate. The slide rule is an incredible tool that was used for hundreds of years before calculators were invented. It can also be used to find reciprocals, squares, square roots, cubes, cube roots, common logarithms, sines, cosines, tangents and cotangents. Contributor. "How to Use a Slide Rule." Sciencing, https://sciencing.com/use-slide-rule-2121781.html. 24 April 2017.